The high-octane Meghalaya and Nagaland poll campaign, during which barbs flew thick and fast among parties, ended on Sunday. Voting in the two states, both having 60-member Assemblies, will take place on Tuesday. The results will be declared on March 3 along with that of Tripura, where elections were held on February 18. The BJP is making a determined bid to expand its footprint in the northeast, buoyed by the formation of its governments in Assam, Manipur and Arunachal Pradesh. But, this time, the BJP is making a determined effort to throw the Congress out of power and include Meghalaya, a next door neighbour of BJP-ruled Assam, in its kitty. The BJP's resolve could be gauged from the fact that Prime Minister Narendra Modi himself spearheaded the campaign. Party chief Amit Shah, Union Home Minister Rajnath Singh, Defence Minister Nirmala Sitharaman, I&B Minister Smriti Irani and a host of other leaders also chipped in. Union Minister of State for Tourism K.J. Alphons, a Christian from Kerala, stayed put in Meghalaya as the BJP in-charge of the state with a predominant Christian population. From the Congress, its president, Rahul Gandhi, campaigned in the state. Its media chief Randeep Singh Surjewala and MP Shashi Tharoor extended helping hands. With a total of 25 Lok Sabha seats and 14 Rajya Sabha berths, the eight states of the region are crucial for the BJP to add to its number in the 2019 general election. As the clock struck 4pm, campaigning ended in both Meghalaya and Nagaland. Though they are fighting separately, in Meghalaya, the NPP of Conrad Sangma, son of former Lok Sabha speaker P.A. Sangma, is the BJP's partner in the North East Democratic Alliance (NEDA). In Nagaland, the BJP's hope hinges on its alliance partner Nationalist Democratic Progressive Party (NDPP) of Neiphiu Rio, which is contesting 40 seats. The BJP is fighting 20 seats. In Meghalaya, the election has been countermanded in Williamnagar in the wake of the killing of NCP candidate Jonathone N. Sangma in an IED blast during campaigning. There are 370 candidates in the fray in Meghalaya whose fate would be decided by EVMs on February 27. Chief Electoral Officer F.R. Kharkongor said 67 all-women polling stations and 61 model polling stations have been set up for the first time in Meghalaya. Thirty-two women are in the fray, the maximum so far in electoral politics in the state, he said. 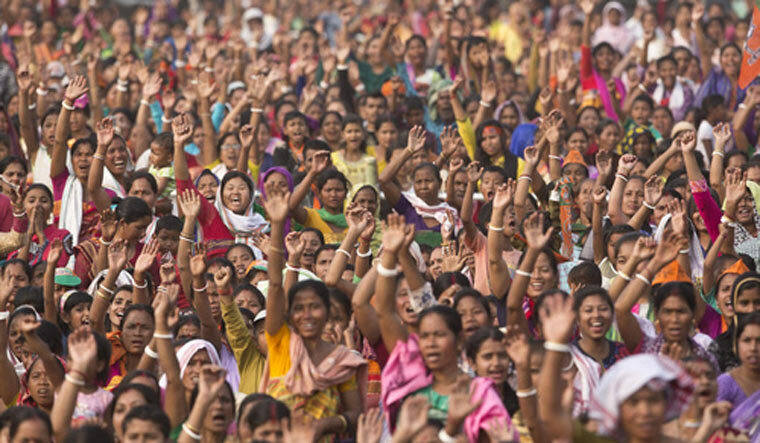 A total of 11,91,513 voters, including 5,89,806 women, will exercise their franchise in Nagaland on February 27. In Nagaland, voting will be held in 2,156 polling stations as 40 polling stations fall under the Northern Angami-II seat, from where Rio has won unopposed. In view of the no-election diktat from the Core Committee of Nagaland Tribal Hohos and Civil Organisations advocating 'solution (to the Naga political issue) before election', political parties initially kept away from the poll. Though filing of nominations started on January 31, the first batch of 22 contestants filed their nominations only on the penultimate day on February 6. The last day saw heavy rush of nominees filing papers.